That governments are, and will always be, involved in education, is taken for granted by the majority of educationalists. Recent market reforms are condemned, because they appear to undermine state intervention in education. But are justifications for state intervention in education philosophically sound? Is the attack on markets justified? In Disestablishing the School, Dr Tooley explores these issues, setting recent educational policy debates in the broader context of debates in moral and political philosophy, and philosophy of economics. Topical issues to do with equality of opportunity, education for democracy, education for autonomy, democratic control of the curriculum, and education as a public good are examined. None of these survive as a critique of markets in education, nor as a justification for state intervention in education. 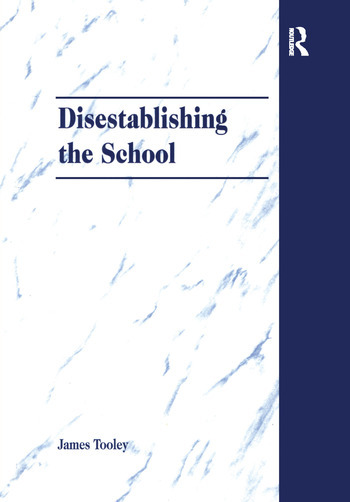 In undermining these arguments, Dr Tooley argues that the case for the disestablishment of the school, for the separation of school and state, can be philosophically sustained. Contents: Education and the state; Equality of opportunity; Education for democracy; Education for autonomy; Democratic control of education; Education as a public good; Education and the state revisited; Bibliography; Index.